This luxe experience the jewelry designer planned for her besties, will have everyone floored. On your big day, you want those close to your heart to be close by. If you’re wondering how to inform your squad that you would like them to be your bridesmaids and men-of-honor, you’ll be glad you chanced upon this post. 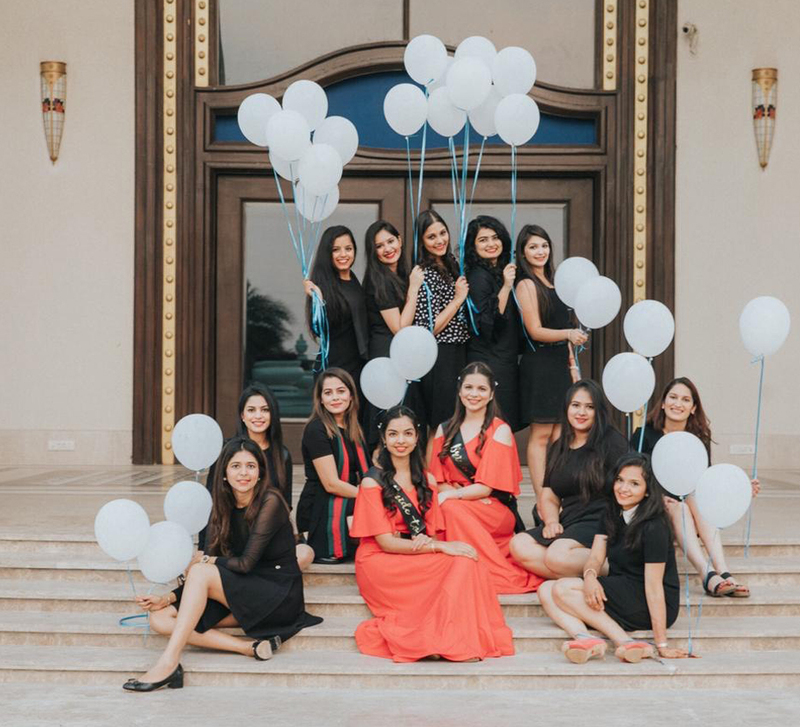 Kaabia Grewal, Co-Founder of Outhouse is set to marry soon and decided to ‘pop the question’ to her closest friends in ultimate luxury and style. Get ready to take notes - this is how she did it. For this bride-to-be, her friends are family and she wanted the ‘proposal’ to be super special. The idea was to go beyond mere gifts and keepsakes and make it memorable. So she went the experiential way; a royal getaway to one of her favorite cities – Bikaner. The trip was titled “The Royals of #Kabanng” and for three days, the party camped at the Narendra Bhawan, Bikaner. The property taps into memories of Rajasthan's regal past and the trip was high on love and luxe. The invitations set the anticipation to ten! Designed by Emmerence from Potesta Designs, they referenced her wedding destination, the JW Marriott Phu Quoc Emerald Bay Resort & Spa. Inspired by the artsy, eclectic aesthetics of the property,the invites had a gorgeous whimsy to them along with personal touches – like pearls, a favorite of the bride - representative of her brand Outhouse. Each monogrammed card was personalized with handwritten calligraphy and was sent to “The Royals” along with the most beautiful wildflower bouquets curated by Fiorella - The Flower Boutique. After their arrival at Narendra Bhawan, Bikaner, the troupe were allowed to refresh themselves before being led to the pool area for a big surprise. Kaabia began with a short speech telling everyone how grateful she was for them always having her back and how much they meant to her. Then, she called designer Atsu Sekhose forward and informed everyone that he would be making their outfits for the wedding! 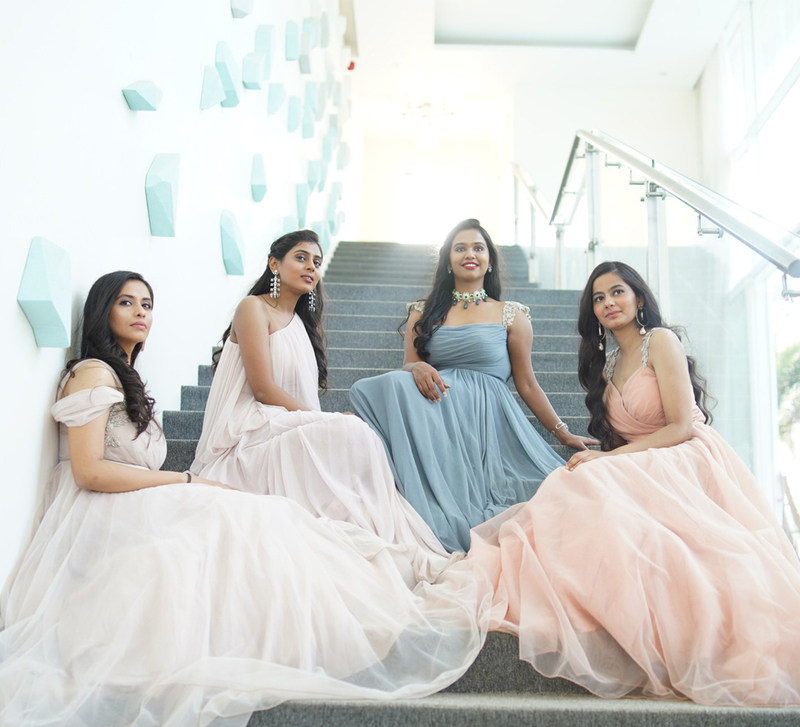 Kaabia wanted each of them to wear something that defined their style and turned into something they loved and everyone sat down and brainstormed with the designer. The evening brought another unique experience. On their return to their rooms, everyone was greeted with a box from Laquna with robes that bore Kaabia’s logo on them. Also included were baubles from Outhouse and soon everyone was getting ready for the night’s blindfolded dinner titled “The Royal Robe”. Eyes shut, appetites whetted, the diners could hardly contain their curiosity and kept guessing the names of the delectable food they were being treated to. Each course was paired with the finest red and white wines. There was a gorgeous lemongrass and passion fruit confection for dessert and the meal ended with mint tea. From there, the troupe trooped to the ‘The Royal After Party’ at the Laxmi Niwas Palace to raise a toast to Kaabia and Rushaang’s impending wedding. After an action packed first day, the squad welcomed the languid pace and relaxation on day 2. Kaabia had planned a safari picnic so everyone travelled a mere 30 minutes away from the hotel to Darbari Lake. Here, they were greeted by the staff of Narendra Bhawan Bikaner and indulged with an outdoor cocktail bar and tunes played on the ravanhattha. As they lounged with their delicious cocktails, the celebration eased its way into the midnight hour. Kaabia and her squad sat there taking in the beauty of the night landscape with the moon casting its glow on the glistening lake while conversations and laughter unfolded. As the last day of their getaway dawned, the squad got ready to spend some quality time with each other before it was time to part ways. All of them made their way to the Junagadh Fort for some sightseeing and the chance to immerse themselves in the local culture, adding another layer of richness to their experience. Then it was time to bid farewell and though the trip was over, they have the wedding to look forward to and a lifetime of being there for each other. Something Kaabia had reminded them of in exquisite detail.